Will this program work on my Mac? Yes, Cook'n Version 10 will work on both Macs and PCs. Both versions have the same features and capabilities. To order the Mac version click here. To order the PC version click here. Do you have a Canadian or international version of Cook'n? No, however, a number of international customers have found Cook'n suitable to their needs. 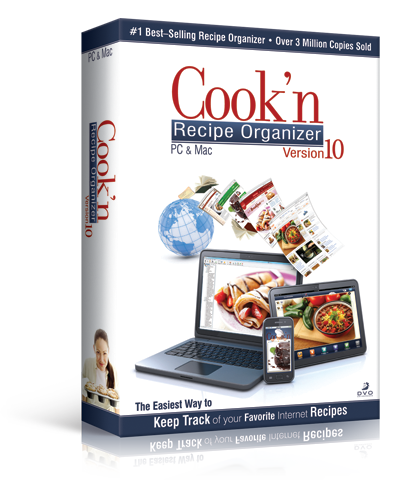 Cook'n Version 10 allows you to add any foods or brands not already included in the program. You can even add additional units of measurement! Can I scan recipes into the program? Cook'n gives you the ability to easily insert scanned images as recipe pictures. Even though, by using scanned recipes, you wouldn't be able to take advantage of all of the Cook'n features (nutritional analysis, shopping list, etc.) many people chose to go this route to organize their recipes within one central database. We invite those interested in Cook'n to take advantage of our 200% guarantee, which states that after purchaing, if you are not satisfied, you'll get a full refund AND we will pay for another recipe software program of your choice. Can I use Cook'n on my mobile device? Yes! We have Cook'n apps available for iPhone, iPad, and Android mobile devices. For more information click here. Can I install Cook'n on all of my personal computers? Yes! This is one of the cost-savings advantages of Cook'n. Other recipe software programs like Living Cookbook require you to purchase a license for each computer you use it on, which can get expensive very quickly. We simply ask that if installing the software on another computer that you keep it for use within your immediate family. This applies to both the download and CD. How accurate is your nutritional analysis? The analysis is very precise. It is based on mathematical formulas, not estimations. Cook'n takes the nutritional facts for each food item (which can be altered by the user if desired) and can determine the analysis for a specific recipe, menu plan, or shopping list. When computerizing seven different American Diabetes Association (ADA) cookbooks into the Cook'n format, ADA admitted that the nutritinal values that were derived from Cook'n were even more accurate than what they had published in their hard copy versions! Many professionals in the food services use our product because of its exactness in calculations. How does the free eCookbook deal work? After registering your version of Cook'n, you will receive access to a free download for any one of our 50+ eCookbook titles! A coupon code will be sent to your email within a week of your product registration. These titles contain hundreds to thousands of recipes and often have pictures included. They download directly into Cook'n and can be used alongside of your personal recipes for menu planning, nutritional analysis, etc. There are a number of recipe software options. Why Cook'n? Those who use actively use Cook'n have overwhelmingly reported that the benefits have outweighed the costs of the program. We've been in business for over 20 years and have carefully designed the program to assist the needs of our customers, specifically to help save time, save money, and to assist families in eating healthier. But don't take it from us, take a look at what customers have told us about Cook'n over the years. We've has partnered with major brands such as Taste of Home and Gooseberry Patch and Cook'n is one of the few programs that allows these popular cookbooks to be downloaded directly into the program. We publish monthly newsletters with fun, informative cooking articles, video demonstrations, and recipes and meal plans that you also download into Cook'n for free. We also have an expansive collection of recipes that can be downloaded from our site at no cost. With Cook'n containing several products in one, free updates, access to superior technical support, and a 200% guarantee, you can be assured that we will do our best to help your needs to be met. We hope you'll consider our software and joining the Cook'n family! No problem. Send us a note and we'll get back to you ASAP. Learn how Cook'n can save you over $100 each month! Compatible with 16, 32, and 64 bit systems.